From a distance White Island first appears as a thick plume of smoke rising from the Pacific Ocean. Up close the island off the Bay of Plenty coast looks like the cratered surface of the moon. The hissing and roaring, amidst an eerie mist rising from the crater lake are features of New Zealand’s only active marine volcano. Even though the volcano continues to puff out dense volcanic gas and steam, visitors come by boat and helicopter to explore the unique environment. Jenny and Peter Tait, who have been running boat tours to White Island for 11 years, help volcanologists observe the island’s activity. The active vent on White Island, which formed in August 1998, is called PeeJay named after the couple’s (Peter and Jenny) charter company. Jenny and Peter became official guardians of the island and focused solely on the charter business until 2017 when their company was bought. 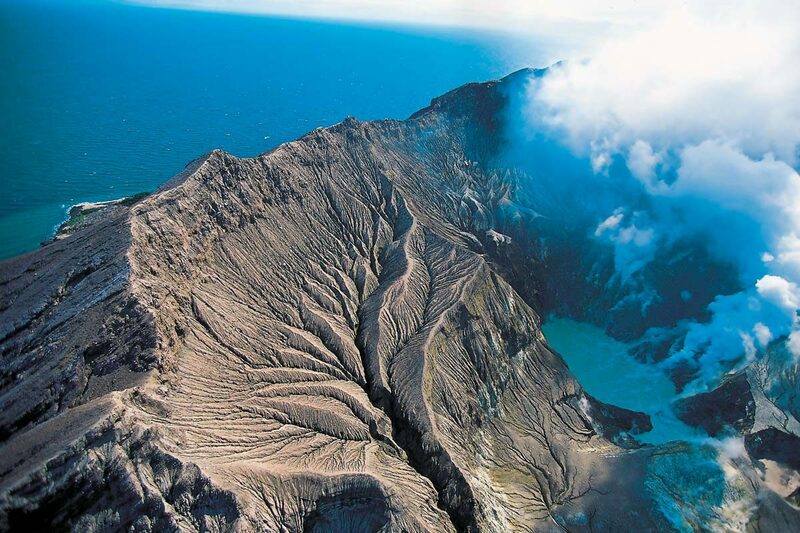 Whakaari / White Island is an active andesite stratovolcano, situated 48 km from the east coast of the North Island of New Zealand, in the Bay of Plenty. It is New Zealand’s most active cone volcano, and has been built up by continuous volcanic activity over the past 150,000 years. The nearest mainland towns are Whakatane and Tauranga.